Colorful beach umbrellas and comfortable beach chairs are lined up on the oceanfront and offer tremendous views of the Atlantic Ocean while giving you the opportunity to sink your bare toes into the white sand. Just across the street from this stupendous oceanfront scene is a North Myrtle Beach resort that puts you just steps away from living the aforementioned scene every day of your North Myrtle Beach vacation. Crescent Towers West is a North Myrtle Beach resort that features spacious North Myrtle Beach rentals. This North Myrtle Beach resort is on the second-row in the Crescent Beach section of North Myrtle Beach, South Carolina. It is a smaller North Myrtle Beach resort with only three levels of North Myrtle Beach vacation rentals and only four North Myrtle Beach condos per floor. Spending your North Myrtle Beach vacation at Crescent Towers West means a more charming vacation experience while still being minutes away from all of the North Myrtle Beach amusements and attractions. Choose a three-bedroom North Myrtle Beach vacation rental that sleeps eight people for your next North Myrtle Beach vacation. There are three private bedrooms, which accommodate six people and then two more folks are accommodated on the sleeper sofa in the living room of these North Myrtle Beach condominium rentals. These North Myrtle Beach condominiums are spacious and full of amenities that you will adore. 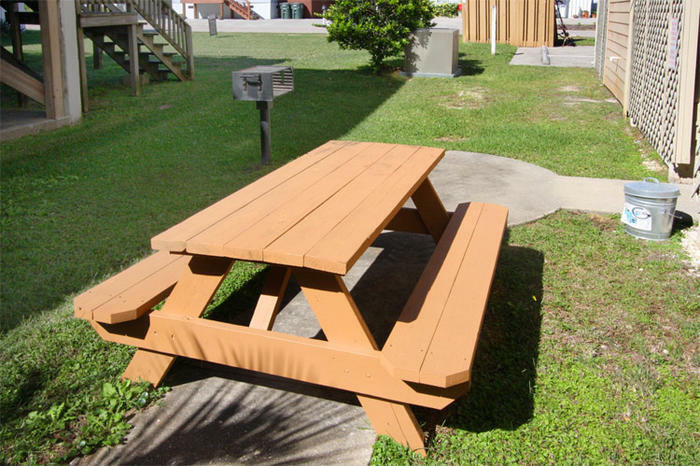 The three-bedroom North Myrtle Beach rentals have two full baths. When there are eight people enjoying a North Myrtle Beach vacation together it is essential to have more than one bathroom. When you enter these condos in North Myrtle Beach, South Carolina you will notice that the kitchen has full-size appliances and is well equipped. Everything you need to make breakfast, snacks and home-cooked meals is provided for you in these kitchens as the cookware, dishes, utensils and small appliances are all there. There is even a dishwasher in these North Myrtle Beach rentals that helps make clean up easy! From the kitchen of these North Myrtle Beach vacation rentals you can see the dining area and into the living room. Relax comfortably at all hours of the day when you stretch out in the living room or turn on the television for your favorite shows. There is at least one DVD player in each of these North Myrtle Beach rentals so you may bring a movie or two from home or rent the newest releases from a nearby video store while you are here in North Myrtle Beach, South Carolina.